Oh the joys of technology! At last I have unearthed some pictures of Ecuador and the Galapagos Islands from the depths of my portable hard drive. Come back with me to 2004, and enjoy the experience! It is Sunday 12th December, and I haven’t recovered from the journey: a headache, which isn’t bad enough for Panadol but enough to make me feel below par. The flight from Madrid was fantastic: I was upgraded to Business Class and had a glorious restful time. We tour Quito. Bus first, to see the Virgin of Quito with eagle’s wings atop the world, treading on a chained dragon. Quito spreads out before us, a vista of pastel-coloured buildings covering the mountain slopes. Then we trudge round the old town, entering a couple of churches while mass is in progress. I want to buy a book on birds, so Diego our guide takes me to the rich part of town, just like any ordinary shopping mall. The only bird book available is a scientific double volume costing $128, so I buy one on Galapagos birds instead. We drive through endless Quito the following morning, until at last we reach the countryside. Very steep mountains and valleys on all sides. We descend through the cloud forest – thick tropical undergrowth. The vegetation is familiar, and I realise with a deep sense of joy that we are at the same latitude as tropical Africa. We pause to walk in a place abounding with exotic orchids, winding round steep muddy paths, and enjoy our first dose of hummingbirds hovering round coloured sugar-water plastic containers. Such delightful birds, so tiny, their wings going literally in circles while they hover. Back to the bus – double seats on the left, single on the right. Down, down and down. Thick dense forest rising in cones around us. Down to Mindo where our altitude headaches disappear and we feel normal again. We’re the only guests in a lodge beside a river, and we have to take our shoes off before entering, to enjoy six more varieties of hummingbirds while we lunch on rainbow trout, beautifully served. We’re not allowed to linger for long, though. A butterfly centre is next, where we witness their cycle of life, before going on to a place where even more humming birds delight our eyes, and going wild with excitement, we grab our cameras. Mine, sadly, is not up to the task. We have tea, and are preoccupied with the birds until nightfall. A mot mot flies in – an exotic bird with trailers in its tail. On the way back to the lodge, half of us elect to walk the final two kilometres. I almost regret it, but feel better when I remove my tight water-proof trousers as the rain stops. At least I have earned my supper. 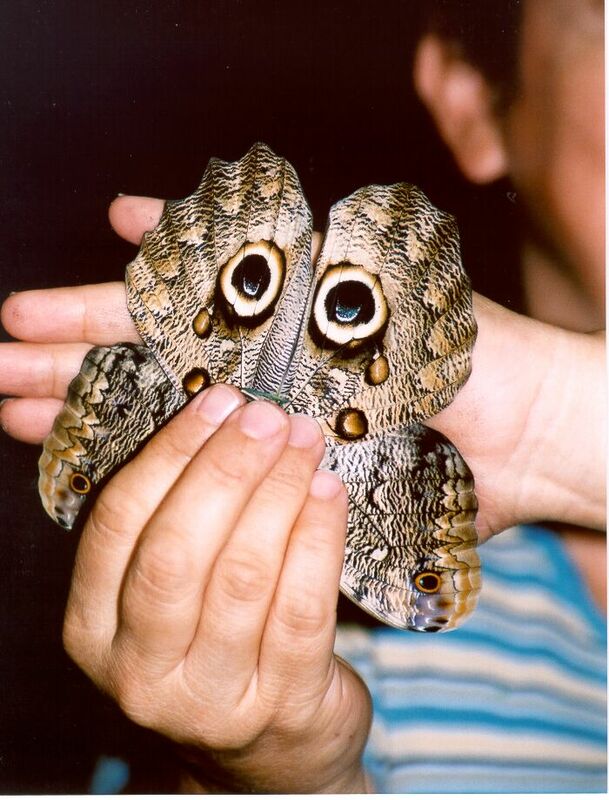 This entry was posted in Travels and tagged Ecuador, humming birds, Mindo, mot mot, owl butterfly, Quito, Virgin of Quito. Bookmark the permalink. Always wanted to go to South America, but even though I’m part Chilean that is looking unlikely in this life. But I got to see my first humming bird in my mother-in-law’s back-garden, sipping from one of those sugar-water feeders. That was in Utah so will see them again when we move to Idaho. The humming-birds are truly amazing creatures. I could have watched them for hours. What a great post, Jane. And I love the mot mot butterfly. We have humming birds outside our window every morning and I know what you mean about their amazing flight. What a wonderful time you had! Oh dear – it just isnt my day today….. that is the owl butterfly, made to look like an owl with clever placement of the fingers. The mot mot is a bird – dont know how that name got onto the caption for the picture! My apologies.